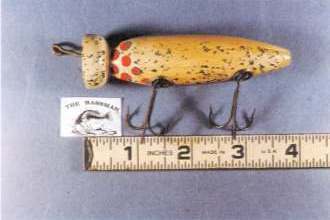 Franklin A. Alger of Grand Rapids, Michigan made a variety of lures around 1910. 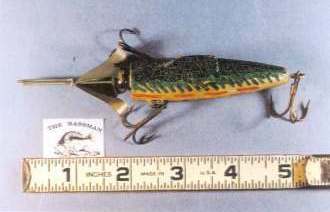 He designed and made over 50 different styles of lures. He hand painted most of his lures. Mr. Alger filed for a patent in 1909 and his patent was granted to him on May 3, 1910. 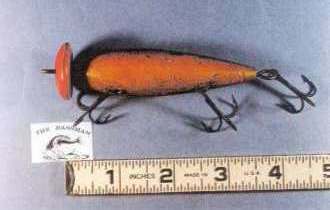 His lures were never produced in large volumes and they were only manufactured and marketed for sale to 1917 or 1918. 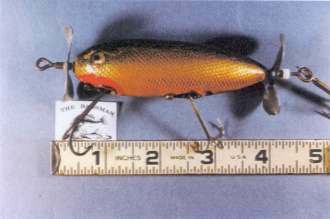 All of the Alger's lures are scarce and considered very rare. 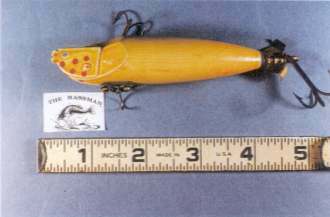 Mr. Alger made his lure bodies on a lathe that he altered from an old foot powered sewing machine. 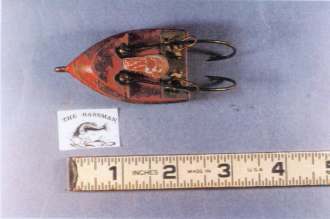 He also made a small hand operated machine that produced spinners that were used on his surface lures. 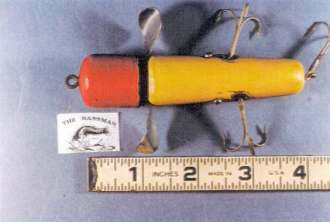 There are no rules for identifying and dating the Alger lures because was constantly modifying his lures and the lure hardware. 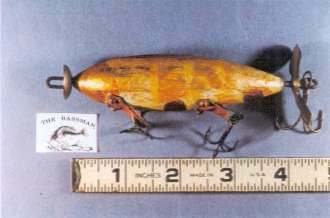 In addition to making fishing lures Mr. Alger made split bamboo fishing rods, gun stocks, carved and hand painted Duck Decoys. By occupation he built homes in the Lafeyette and Franklin street area of Grand Rapids where his family had subdivided some land and sold building sites. Franklin A. Alger died in 1939 at the age of 77. 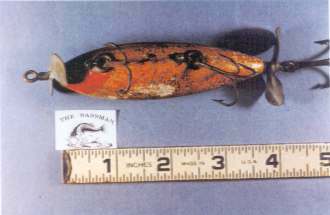 After his death William Sacia brought the Alger lures to his home after helping to remove other household and personal items from the Franklin Alger home. 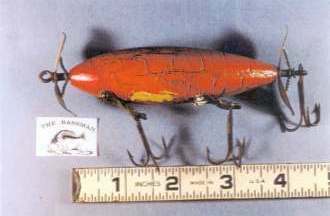 There were many unfinished lure bodies that were eventually thrown out and burned. Franklin A. Alger was William Sacia wife's Uncle and Alger Sacia was the son of Mr. and Mrs. William Sacia. Alger Sacia said he was known to him as Uncle Frank. 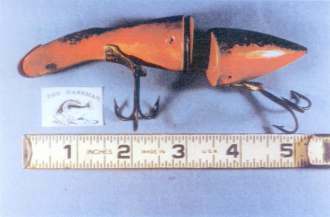 Mr. Clarence E. Zahn acquired the lures from Franklin Alger's home and workshop from Alger Sacia in 1981. Special Thanks to Mr. Clyde A. Harbin Sr. for supplying me with his photographs and this rare information that long and close friend Mr. Clarence E. Zahn furnished him. 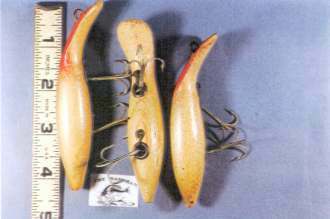 The Alger's lures in these photographs did reside in the Famous Clyde A. Harbin Sr. Collection but since then the Franklin A. Alger lures have moved and now they all reside in The Tim Watts collection. 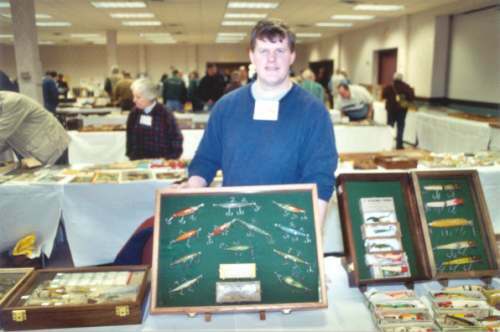 Tim Watts displaying his rare Franklin A. Alger lure collection among other old lures at the Milwaukee National Fishing Lure Collectors Club (NFLCC) January 20, 2001. I had the great pleasure to met Tim in person for the first time at this event. We had the opportunity to discuss fishing stories and old lures. Tim told me a few more stories about his Grandfather the Famous Bassman. This was an special day for me and I will not soon forget this eventful day.